Day Two started off early with my session delivery of CAD Management: The Best is Yet to Come – Career Planning. With a full room present, we discussed issues surrounding the planning needed to manage your career. Some of the topics included: Knowing yourself, Knowing your opportunities and Knowing what you are Looking for. By thinking through these areas, you are setting yourself on track to success. After that it was back to my room to upload the final presentation for those that attended. Then down for lunch. I ate lunch with a gentlemen from the Pacific Northwest – Civil Designer using Civil3D. He has many years of working as CAD Manager for his firm. Great conversation. 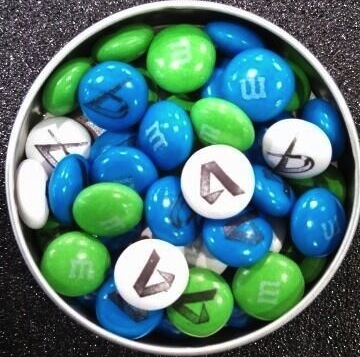 On to the exhibit hall and grabbing some snacks – AU branded M&M’s at the Autodesk booth. 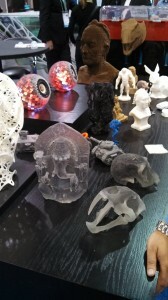 Wandering around I was impressed with the volume of 3D Printers and services available. They are doing some amazing stuff. After a short break in mid-afternoon that I took, it was back to the pre-AUGI Meeting show of technology that included the Glorious Gadgets presentation by Jim Balding and Wesley Binn (Think RTC ). The had demo videos of future technology that was pushing the envelope. Ed Tallmadge of US CAD actually flew a quad copter around the room (like the ones the Amazon might use in the future). The AUGI show presented the stats and facts of all the AUGI initiatives completed and in progress. They are over 337,000 members now. Then it was on to the AUGI Beer Bust. The exhibit hall was packed again. I ran into old friends (like Edward Lick, AEC Solutions Support Manager at STV, Inc.) and then actually won something. I never win anything, but I won an iPad Air – provided by Synergis Technologies . You may know them for the Adept  product line or maybe their Design Solutions . Did I mention that I never win anything? I just was in the right place at the right time I guess. The picture almost makes it look like I am wearing their standard issue outfit… nope. 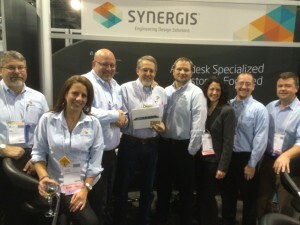 I will admit that I am a long time fan of the Synergis tools and services. What a way to end a great day. Thanks Synergis!!! (for more info contact Kristen at Synergis ) This may look like a blatant plug and it is. I am promoting tools that I think help you get the job done. You should check them out.